The Cairn Terrier is an extremely old breed of dog that originated in Scotland. These small, energetic dogs have a double coat with a coarse outer coat and a softer, flurry undercoat. This type of coat makes the Cairn susceptible to dry or irritated skin. These dogs are also commonly afflicted with allergies that can also lead to skin problems. Treating both the cause and the symptoms will help help dry or irritated skin and make life easier not only for the dog but for those it lives with. Comb the dog. Cairn terriers don't shed much, so when the fur begins to die, you must pull it out before the dead fur builds up and begins to cause skin irritations. In a normal cycle, a healthy coat grows, dies and is removed by grooming. The hair follicles will then grow another coat. To encourage this process, first comb out all the tangles and mats. Run the dog's fur through a stripping knife, holding onto the fur gently but with enough pressure to pull out the dead coat. This fur should come out easily. Opening the hair follicles instead of leaving the dead coat in will allow them to rest before regrowing new hair. It will also keep bacteria from building up around the roots of the dead fur and causing skin irritation. Check for fleas or other skin parasites. These can also be the cause of dry or irritated skin, and will require removal before the healing process can begin. If this is the case, consult your veterinarian for the most effective way to remove fleas and other insects without further damaging the irritated skin. Consider switching food. An imbalanced diet may be the source of many problems for the Cairn terrier. Highly active and energetic, they require a diet rich in proteins in order to keep their skin and coat healthy. Check their food -- if meat isn't the first ingredient, find a food in which it is. Stop bathing unless absolutely necessary. While medicated shampoos and conditioners that advertise they soften coats and soothe dry skin, even they are not a good idea for a Cairn. Cairns have naturally occurring chemicals in their skin that keep their coat and skin in good condition; using shampoos and conditioners repeatedly can damage the skin and wash away the fur's natural chemicals. Check the dog for allergies. If removing dead fur doesn't work, it's possible the dog suffers from allergies. 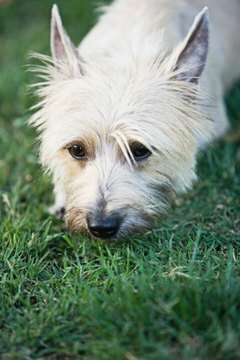 Cairn terriers are very susceptible to allergies, and two of the most common problems are things that they run into the most often: grass and corn-based foods. If dry skin is chronic, have the veterinarian check the dog for allergies. Antihistamines or cortisone can help clear up the allergies and, in turn, fix the associated skin conditions. Groom the dog at least once a week to get out mats and tangles. Once familiar with the dog's coat, it will be easy to tell where and when there is dead hair that needs to be pulled.